The interior walls are pre-finished. For the prototype I used 1/8″ mahogany type plywood that came as packaging for sheet metal. It actually doesn’t look too bad. 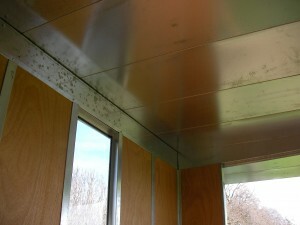 The metal strips are the clips used to assemble the building. The building was easy to assemble. I first built the floor the same size as the exterior dimensions of the building. Next, the bottom sill was attached to the floor. 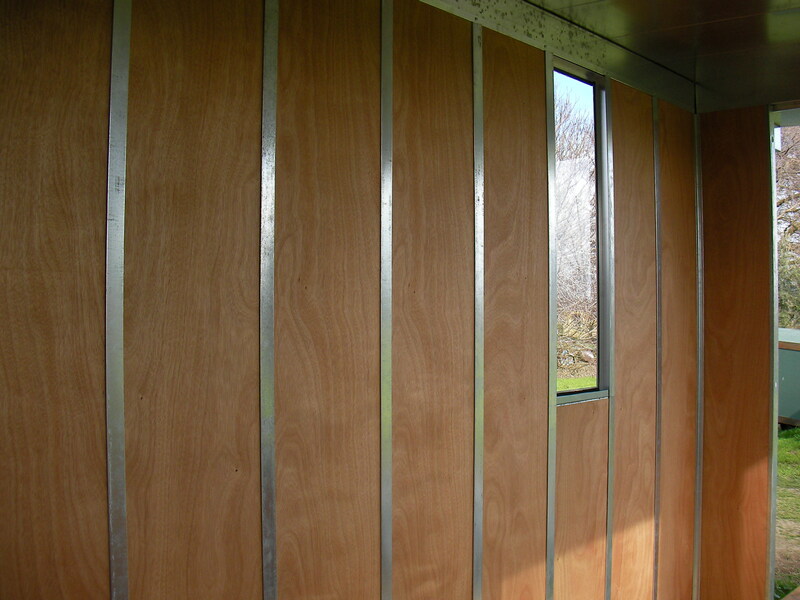 The bottom sill adds horizontal strength to the walls, attaches the walls to the floor, and diverts any water that gets between the panels to the outside of the building. The corners were caulked to make them watertight. 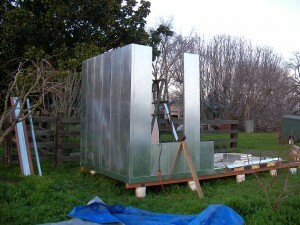 Starting at one corner, the wall panels are placed on the bottom sill and a ‘c’ clip is slid over the flanges of adjacent panels, connecting them together. 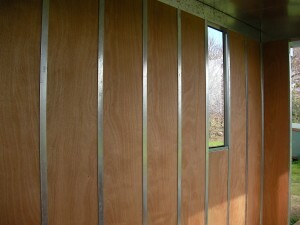 A sheet metal screw on each side of the inside of the panels attaches the wall panel to the bottom sill. 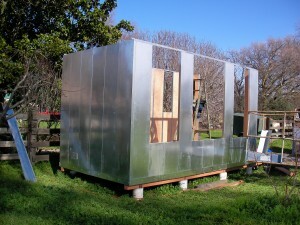 Half panels or quarter panel are used where there will be windows. Continue placing wall panels until the walls are complete, bracing where necessary. Once the wall are complete, ‘Z’ flashing is screwed to the top of the walls. 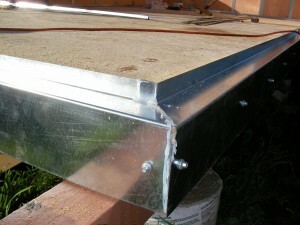 The roof beams are placed on the ‘Z’ flashing, bolted together, and screwed to the ‘Z’ flashing. The front roof beam is 2″ x 2″ and the rear roof beam is 2″ x 6″ to give the roof a slight pitch. There will be a small porch in front of the door and the roof will extend over it. Next, the roof panels are placed on the roof and screwed to the roof beams using an angle bracket between adjacent panels. The adjacent panels are then clipped together with a ‘C’ clip. The ‘C’ clip makes an extremely rigid joint and seals the joint from the top so water cannot penetrate. 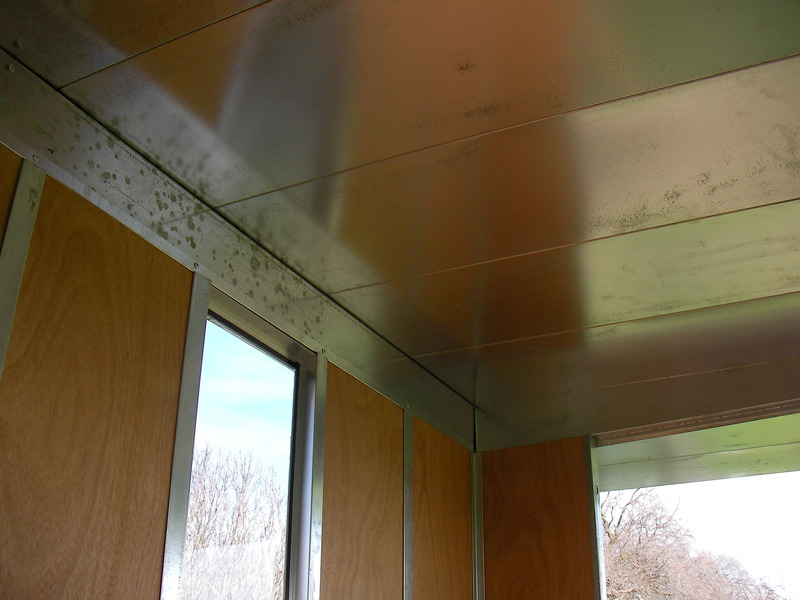 The ceiling is exposed galvanized metal with seams every 16″. It could be painted or covered with acoustic tiles or some such thing. I like the natural galvanized metal. Once the windows and doors are installed, the building is complete. If one wants to run electrical wiring in the walls, the interior wall panels are removable and there are pre-punched holes at the top and bottom of the panels for wiring. 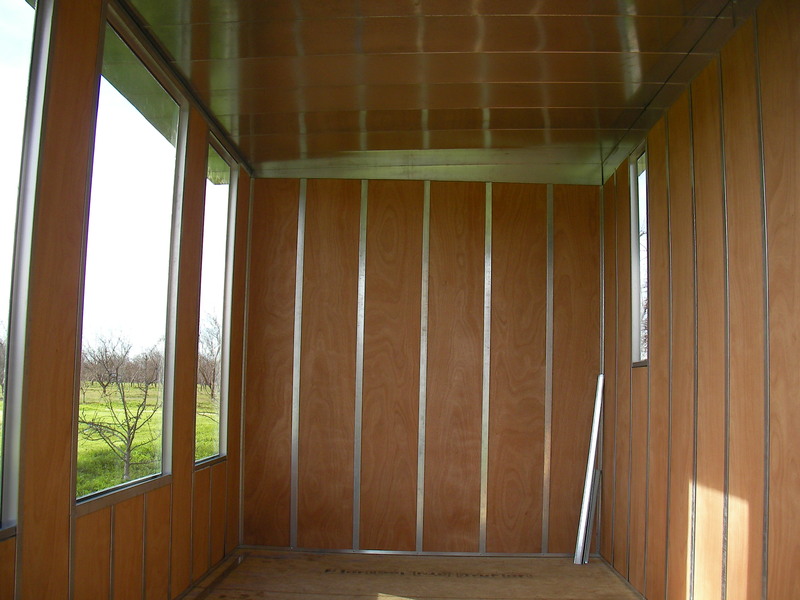 Interior walls can be built and plumbing added if required. Just wanted to offer some encouragement. That’s really pretty damned cool. If you could figure out a way to make land as cheap, I think I’d have to have one of your buildings. Do you have any plans to make them available commercially, or even just plans, or to teach others how to build them, anything of that sort? Keep up the good (no, great) work. Thanks. I hope to make open source plans for all of the components available as soon as I figure out how to do it and have time. 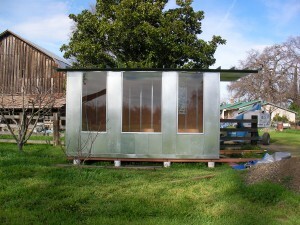 hi eric, i want to build a jewelry studio in my backyard in oregon and this would be perfect! 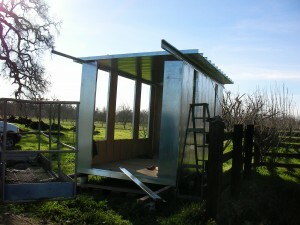 i can build 200 sq. ft. without a permit in my county. do hope you can make the plans available. your building is so cool! Love this out building, i wonder if i can have one in my front gardon for a workshop! Keep up the great work. Would love to build one as a workshop. 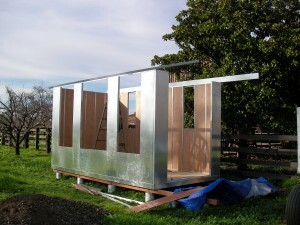 Also might be a way to make temporary housing for Habitat for Humanity projects. I’d have to add basic plumbing but I’m already gonna be on septic so it would be much better than an old trailer for the weekends I’ll be spending at the lake while building my retirement shack. 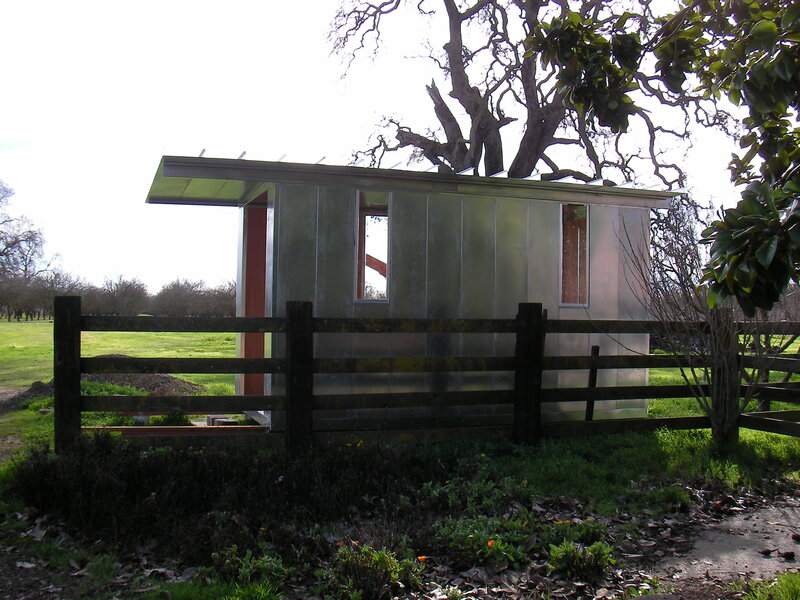 It could even serve as guest quarters down the road as well (You know, guests that you don’t want to stay too long). How long do you think it might last with light snowfall each year, and what would you have to do to it if you expected twice as much snowfall every few years? I keep checking back for those plans you mentioned. 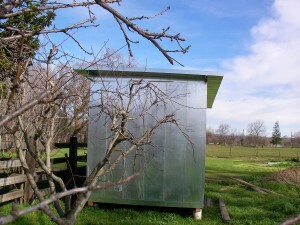 This seems the simplest way to build a solid little shack. 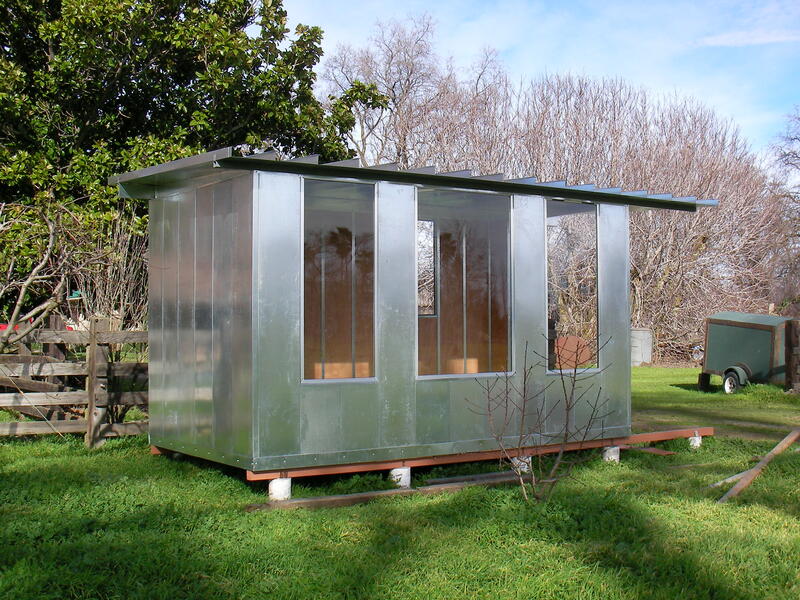 If I could get plans I’d build it in one of those storage rental places, and stick it out on some cheap scrap of rural property. Add a little solar, a couple of simple rv-style appliances for the kitchen, a composting toilet, and a loft…livin’ in style. That’s actually a very slick design. 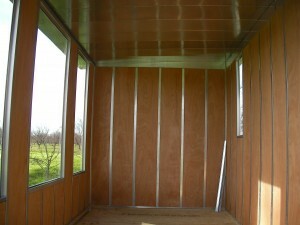 The pricing is on par with a storage shed of equal size once you insulate and finish the interior. 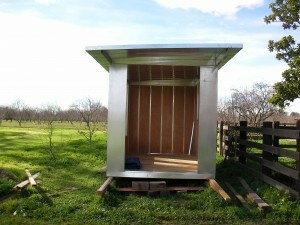 But your design has the added advantage of strength and portability. Built in insulation, attractively finished interior, and radiant barrier inherent to the materials you used. You may be on to something! I don’t know much about snow removal as I’ve lived in California most of my life. I imagine one would shovel it off the roof when it gets too deep. Or maybe turn the heat up high inside and melt it off. 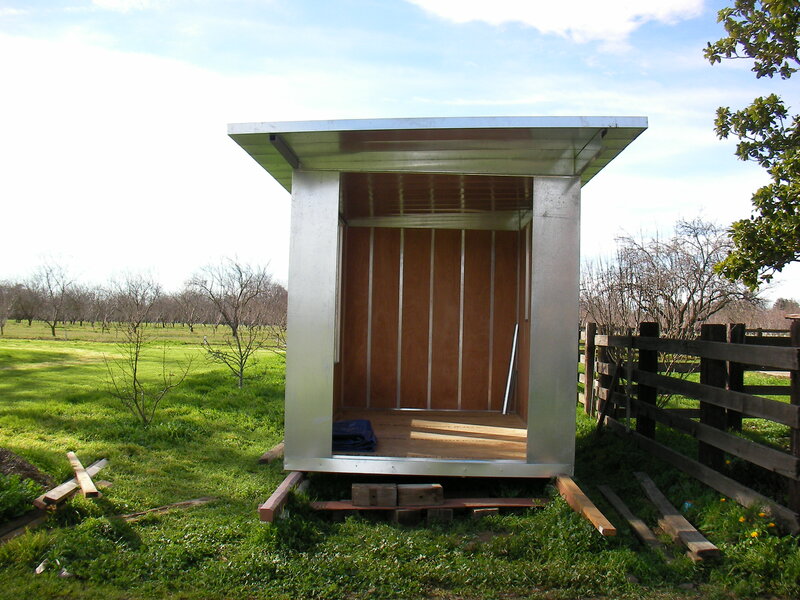 Haven’t gotten to the plans yet – I got sidetracked by some other projects, and I’ve thought of a bunch of improvements I want to try out on the Basic Shelter. Thanks, Doc. I like your blog. I’ve always been kind of interested in recumbent bikes. I never thought about how their architecture would affect one’s ability to climb hills. I’m also surprised that they aren’t comfortable on rough terrain. For some reason I imagined they would be really comfortable, kind of like pedaling around in a barcalounger.